Adapted Recipe: Vegan Sweet Potato, Black Bean & Kale Enchiladas! 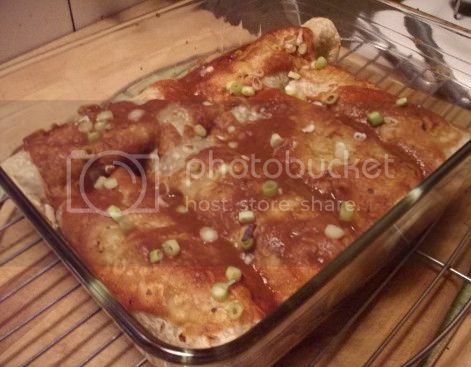 Hands up if enchiladas are the first things that pop into your head when planning dinner. I know, me neither. Which was why I surprised myself a week or so ago when the idea struck me to make enchiladas with sweet potatoes and kale. Honestly, I thought there was a recipe for that exact thing in Veganomicon, but when I looked it up, I found that I was mistaken. That recipe is, in fact, for potato and kale enchiladas with a sauce for which I didn’t even come close to having all of the ingredients. 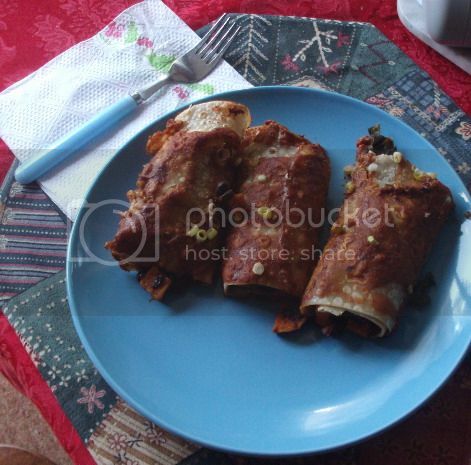 However, Vegan Planet got a little closer with Robin Robertson’s recipe for sweet potato and black bean enchiladas. Problem being the sauce for those was supposed to be straight-up salsa, and the only salsa we have happens to be habenero lime, which is almost too hot even for me, the lover of all things spicy. The resulting recipe relies heavily on the Vegan Planet enchiladas in preparation, including roasting the sweet potatoes for more depth of flavor. The Veganomicon recipe contributes the kale and the cooking method for it. The only thing that I didn’t use from either one was the sauce. Technically you can use salsa if you want, but I wound up going with the homemade enchilada sauce from The Happy Herbivore Cookbook . It makes a lot of sauce, so you’d only need about half a recipe for this. Of course, you can also use storebought enchilada sauce. I encourage you to try making your own, though. The Happy Herbivore stuff had a great, full flavor stemming from a simple-yet-delicious combination of ingredients, including the sneaky addition of cocoa powder. Whatever you choose, the sauce really makes the meal, so choose wisely! A note on the tortillas: it doesn’t matter what variety you use, just so long as they’re large enough to accommodate all the filling. I used Food For Life brown rice tortillas and they worked very well. Plus they’re a good choice if you want to make the recipe gluten-free! Preheat the oven to 400F. Lightly oil a baking sheet and spread the sweet potatoes on it in a single layer. Roast until tender and lightly browned, about 20 minutes, turning once. Reduce the oven temperature to 350F. Heat a thin layer of water in a large skillet over medium heat. Add the garlic and chile and cook until fragrant, about 1 minute. Add the kale to the skillet along with a little bit more water. Cover and cook until bright green and wilted, about 5 minutes, stirring occasionally. Add the beans, tomatoes, chili powder and black pepper to taste. Stir in the sweet potatoes and simmer until heated through, about 5 minutes. Spread a thin layer of sauce in the bottom of a 9x13in. baking dish. Spoon some of the filling into a tortilla, roll it up carefully and place it seam side down in the dish. Repeat with the remaining tortillas and filling. Pour the remainder of the sauce over the top and sprinkle with the scallions, if using. Cover and bake until hot and bubbly, about 20 minutes. Adapted from Veganomicon and Vegan Planet.